In this book the learned authoress has studied Shibli Nu’mani at length in relation particularly to his religious and political writings, and has tried to bring to light, or rather to life, certain moribund aspects of Shibli’s manifold intellectual personality. In the process she has been able to present a vastly modified picture especially of Shibli’s religious thinking, and has generally shown that Shibli had a much more modern mind than he is usually credited with. The man who is the subject of this book is one of the foremost figures of modern Muslim India but one whose individuality, depth and many sidedness have yet to be properly appreciated. 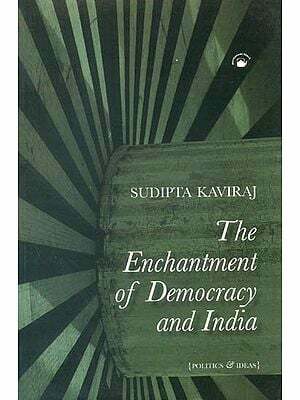 At once a scholar of formidable learning as well as a thinker of independence of mind, he left behind, him an extensive body of writings very wide ranging in scope and of great interest. Among them are essays that not only contribute to understanding the man and his age but which are also of rr.uch value in themselves and which merit far more attention than they have so far gained. 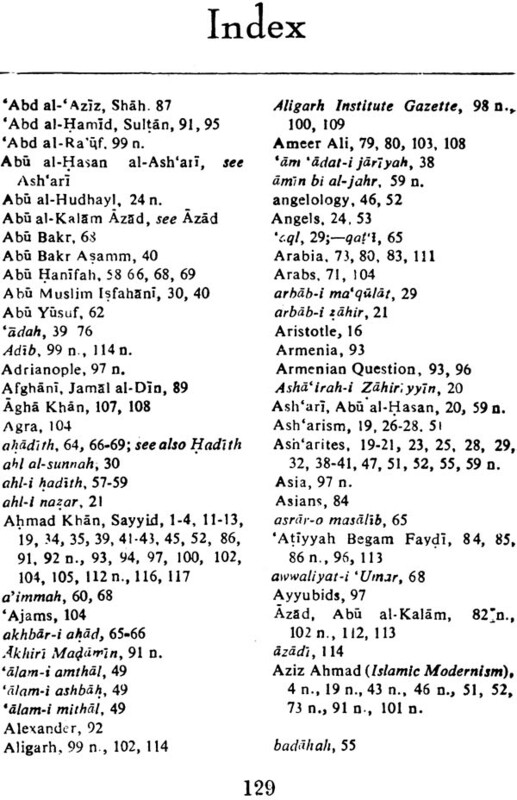 Among the strengths of the present volume is its demonstration of the multi-facetedness of Shibli. Thus, it serves to correct a distorted image by presenting a more rounded view of his imposing personality than was previously available. 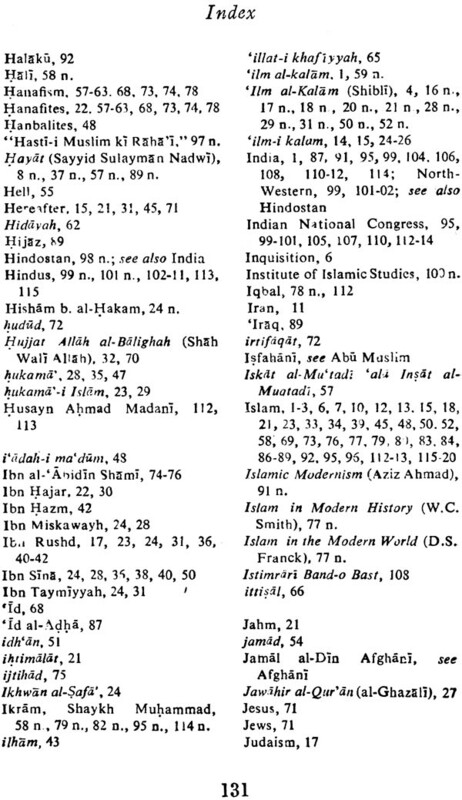 Almost every writer on the evolution of the Muslim community in the Indo-Pakistan subcontinent during the past hundred years has found it necessary to devote some pages to a consideration of Shibli and his thought; he is not, however, well known outside the circles of those who have specialised in the study of Indian Islam. 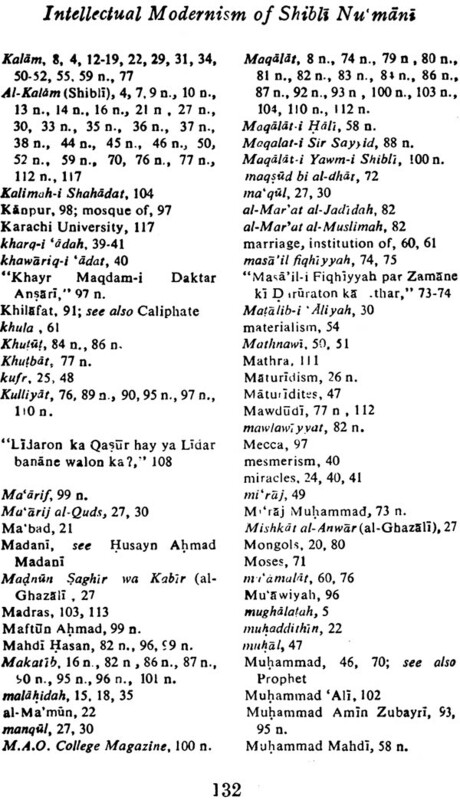 The approaches to him in the literature have been-dominated by two considerations: (1) the desire to see him in the light of the developments among the Muslims which led to the partition of the subcontinent and the emergence of Pakistan and (2) the desire to assess his contribution to the intellectual evolution of the Muslim community in the modern period more generally, that is, to evaluate the effect he may have had in changing the ways Muslims have thought and acted in regard to their modern situation. 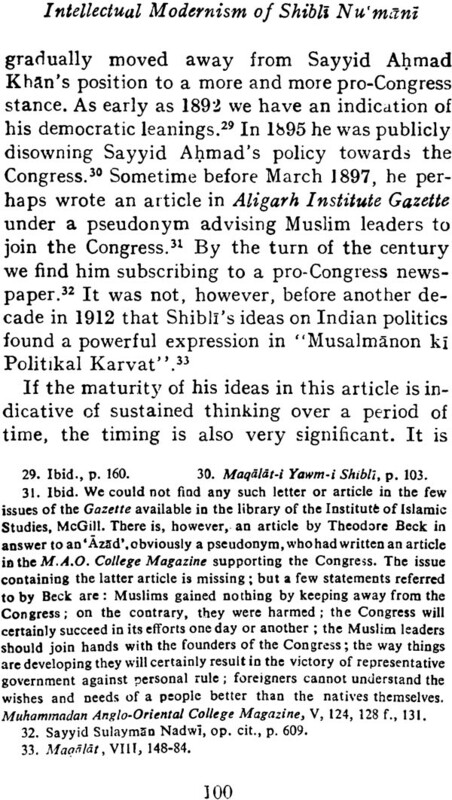 In neither of these respects did Shibli make an important mark on his contemporaries, and it is this fact which, perhaps, more than anything else, accounts for the relative neglect he has suffered at the hands of students of Islam in modern India. 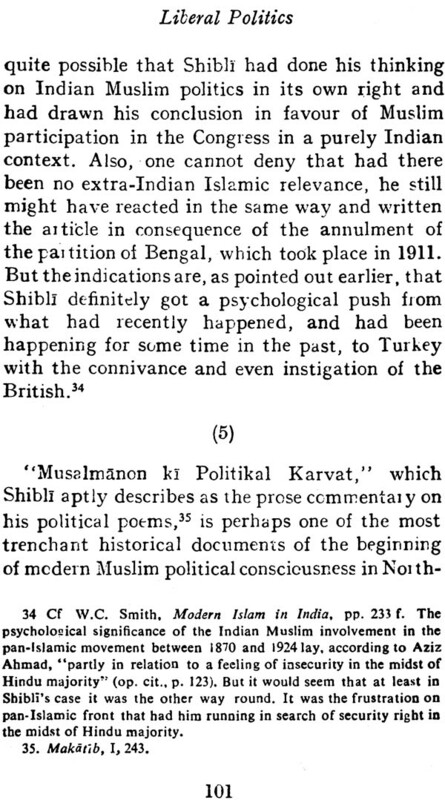 As the present volume shows with great clarity, Shibli was not actually involved in the political stirrings that began to agitate the Indian Muslim community toward the end of the nineteenth century, nor did his attention focus primarily on the issues that arose from the burgeoning desire among Muslims to rehabilitate the fortunes of the community, socially, economically, politically and militarily. If he is judged from the standpoint et the Muslim nationalism that produced Pakistan, his contribution may appear to be unimportant and his efforts to have been misguided. If he be judged for his stance toward the problems that were central to the heroes of Muslim renaissance in modern times, whether in India or elsewl.ere, he may be seen as irrelevant or even as obstructive to reform efforts. Most scholarly opinion has viewed him as a partially enlightened conservative, but none the less essentially an up- holder of the Islamic status quo in India, laying emphasis upon those of his writings which celebrate the glories of Islamic history and upon the nature of the education offered in the Nadwat al- ‘Ulama.’ in contrast to Aligarh. Such judgments are inadequate, principally because they are made according to criteria that do not fit Shibli’s case. In his time Shibli was concerned with matters other than those which subsequent events have raised to the position of first importance. If he is to be understood for what he was and for the values he may have to transmit, efforts must be made to view him in his own terms and to penetrate into the peculiar nature of his own mental set. The present volume is a determined effort to achieve these goals. By going beyond the perspectives characteristic of the majority of scholars, the work has contributed in a substantial way to a more enlightened grasp of Shibli and to a fuller appreciation of his contribution to Islamic thought. It goes far toward righting the balance in the studies devoted to him through underlining his complexity, the highly individual nature of his preoccupations, the variety of his concerns and even the occasional inconsistency of his thought. The result is a more vivid and more valid picture of Shibli as a man. One of the important emphases that emerges in the work at hand is Shibli’s concern with the rethinking of fundamental Islamic theology. Unlike many other Muslim leaders in recent times, he both recognised and acknowledged a threat to his religious faith from science and the modern intellectual milieu, and also unlike others his response did not come as de1ensive apologetics but as a creative reconsideration of the Islamic heritage in the light of the problems posed by science. The problem of an adequate theological stance in our difficult age was of deep personal concern to him; the issues were rooted in a keenly felt puzzlement of mind and a genuine personal need to gain a satisfying intellectual grasp of his religious faith. He was thus involved with the philosophy of religion, one of the small group of significant modern Muslim thinkers to have been so. Although one may not be satisfied with Shibli’s resolution of the problems he discussed, and that of science and religion in particular, the very fact of a first-rate thinker’s having seen the importance of these problems and given himself to energetic thought about them is itself of much significance. This side of his thought deserves greatly increased attention, and hopefully it will serve as a stimulus to others to follow his lead. It is at once an expression of confidence in the strength and richness of the Islamio heritage that enable it to with stand close investigation and adaptation, as well as a demonstration of an inquiring and modem spirit. For Shibli there was no cause for fear in subjecting his Islamic faith to close scrutiny, only the irresistible drive to bring his religious commitments and his intellectual convictions into accord. The debt of the scholarly community to the author of this book is due not only for the first full- length study in English of a compelling personality and for the care and thoroughness with which the work has been done, but also for the liveliness of the style in which the whole is presented. Mrs Murad has achieved a compact presentation of her subject in language that is clear, forceful and readable, making her book a pleasure to read. The keenness of her own mind and the pithiness of her expression as well as her independence in following where her evidence has led her are reminiscent of Shibli himself. Her achievement should be an encouragement to others and a proof of what persistence, and hard work will accomplish even when the circumstances in which one must work are not favourable. This study of a single individual’s share in and contribution to the intellectual developments in modern Indian Islam was originally a Master’s thesis submitted to the Institute of Islamic Studies. McGill University, Montreal, Canada, in 1973. It is now being presented to the general readership with very slight changes only. 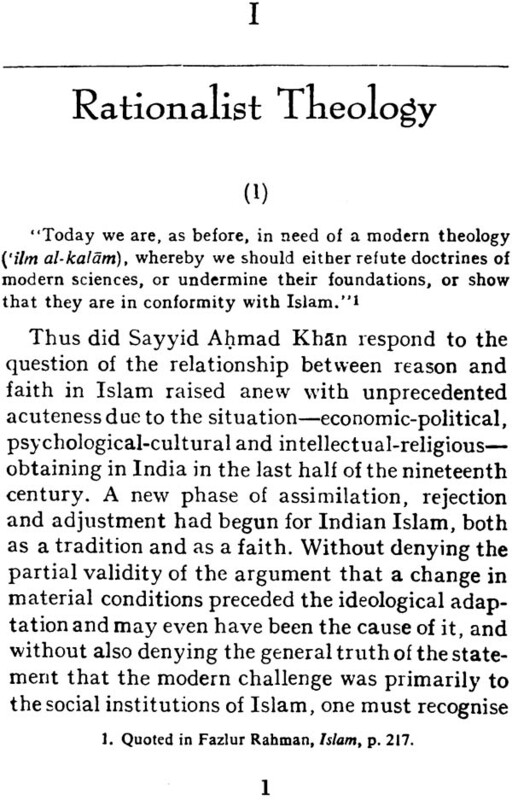 The study assumes much and offers little in the way of a total interpretation of the phenomenon of modernism in Indian Islam, except perhaps that it emphasises the role of ideas in it. Though conceived and executed quite independently of them, the study turned out more and more to corroborate and substantiate. 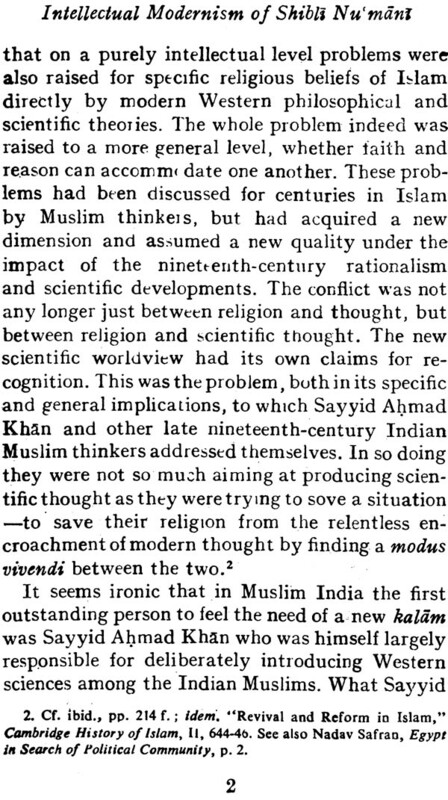 to exemplify and amplify the interpretations (not mutually exclusive) already presented by earlier and worthier students of modern Indian Islam, especially Professors Wilfred Cantwell Smith, Fazlur Rahman and Aziz Ahmad. As it stands now, it is rather an extended footnote to the works of the aforementioned authors in this field. The present writer’s only real claim to originality lies with regard to the subject of this study himself. She has studied Shibli Nu’mani at length in relation particularly to his religious and political writings, and has tried to bring to light, or rather to life, certain moribund aspects of Shibli’s manifold intellectual personality. In the process she has been able to present a vastly modified picture especially of Shibli’s religious thinking, and has generally shown that Shibli had a much more modern mind than he is usually Credited with. Before we try and place Shibli within the context of early modern Islam in India, a few words of qualification seem essential. ‘Shibli’s was, perhaps more than anyone else’s among his contemporaries, a variegated, protean mind. This quality of mind may be attributed to his restless, mercurial soul, to the changing pressures of his times and environs, to the evolution in his thinking or to mere inconsistency in his thought. 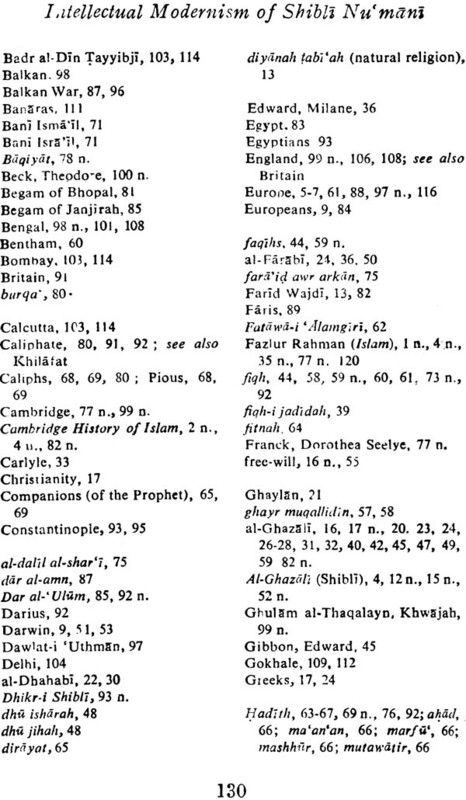 The fact, however, remains that Shibli is a man difficult to categorise, label and pigeon-hole. Not only were his views under going change with the passage of time, but he was quite capable of adopting intellectual attitudes of an essentially different ethos at one and the same time. 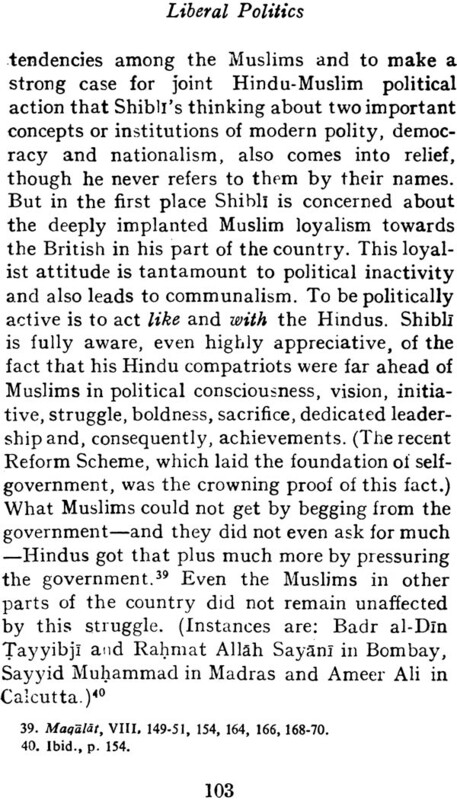 On the question, for instance, of a proper system of education for Indian Muslims, Shibli ended up by being almost a reactionary reformer, which was a far cry from his earlier, more liberal, views on education. 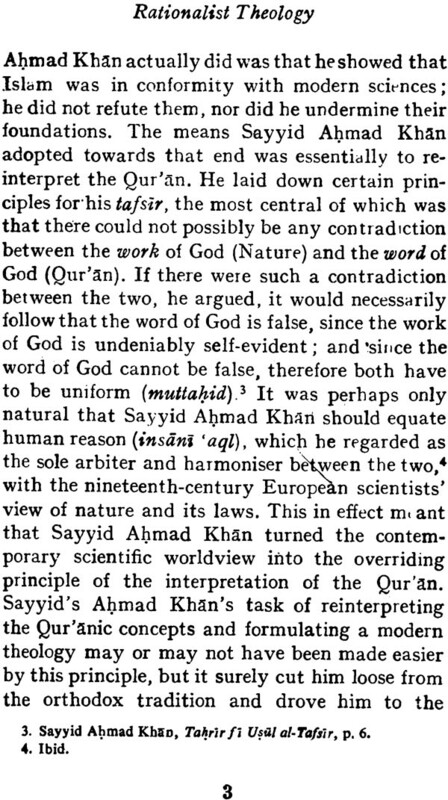 Or, for instance, in his main field of intellectual endeavour, the Islamic past, especially in its cultural-institutional aspect, Shibli remained throughout a romanticising apologist. 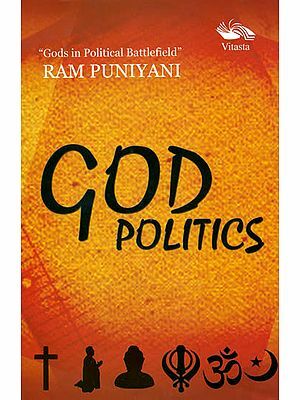 On the other hand, in matters of theology, law and politics he showed an increasingly realistic, modern liberal tendency. And it is these last three spheres of his thought, or rather the liberal-modernist strands in his over-all thinking, with which we have deliberately concerned ourselves in this study. 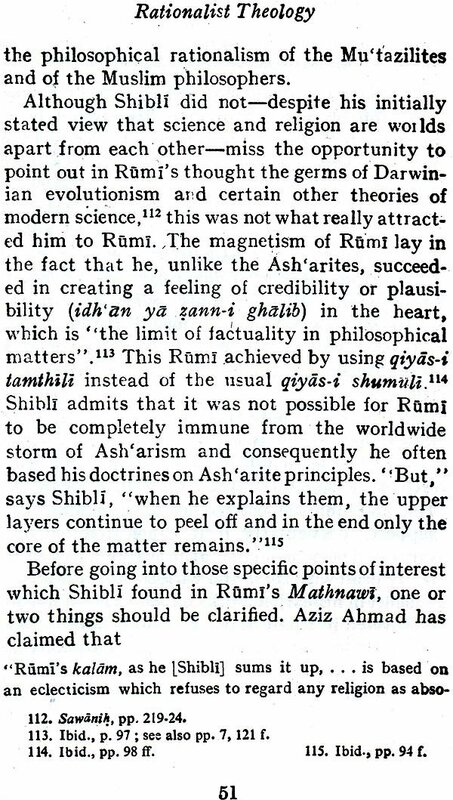 This clarification was necessary in order not only to give due recognition to the various facets of Shibli’s thought, but also to avoid an exaggerated impression about the modernism of it. Modernism was merely one, although greatly significant, piece in the mosaic of his thought. 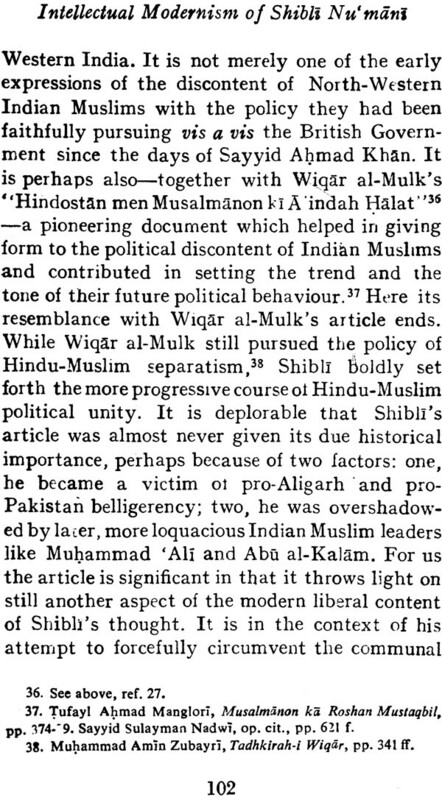 In spite of the foregoing, Shibli has generally emerged in the minds of Muslim posterity in India as a traditionalist, a defender of Islamic faith and history and the author of Sirat al-Nabi and Al- Faruq. 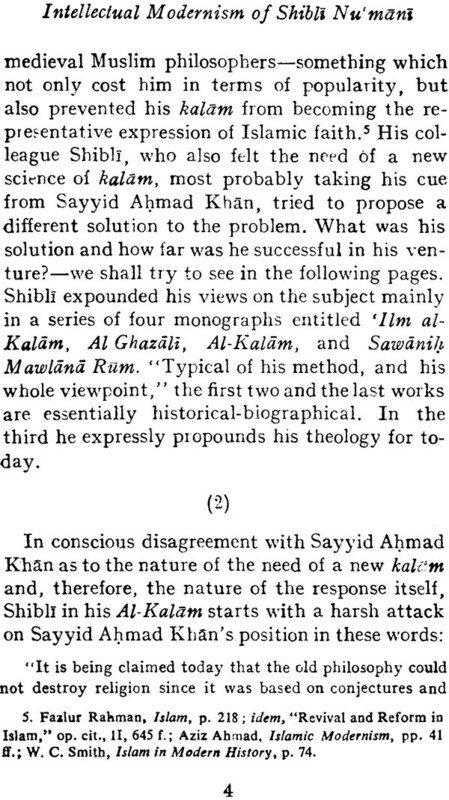 Even to Smith he is “an example of a fairly conservative mind” or at best an “orthodox rationaliser”, This image of Shibli can partly be explained by suggesting, as Smith has done in the case of Shibli’s Egyptian contemporary, Muhammad Abduh, that the liberal element is only partially incorporated in the finished product of his work, and that his work lacks systematic exposition. Shibli’s disciples and devotees also played a large role in building up this image, especially his Boswell, Sayyid Sulayman Nadwi, who ignored or explained away the liberal, progressive elements, and accentuated the conservative and traditional elements in his thought. In fact, Sulayman Nadwi’s biography of Shibli can be justly described as an attempt to paint Shibli in orthodox colours. Even if there had been no deliberate suppression of Shibli’s modernism, there was still no guarantee that the Muslim self image would not have unconsciously trimmed Shibli to its liking. It could not very well shelve and forget his works-something it did to Sayyid Ahmad Khan’s writings-for they were more than gratifying for Muslim self-respect and were part of the Muslim defence mechanism.